A Swiss man has been jailed for 10 years after pleading guilty to charges of insulting the Thai king. Oliver Jufer, 57, was arrested last December after drunkenly spray-painting posters of King Bhumibol Adulyadej in the northern city of Chiang Mai. Earlier this month he pleaded guilty to five charges under Thailand's draconian lese majeste law. Judge Phitsanu Tanbukalee said that Jufer received a reduced sentence because he had admitted his guilt. "This is a serious crime, and he was sentenced to four years for each of five counts, for a total of 20 years," he said. "Because he confessed, the court has reduced his sentence to 10 years." Jufer is believed to be the first foreigner ever imprisoned for the offence. Others have been charged in the past, but later expelled from the country rather than jailed. 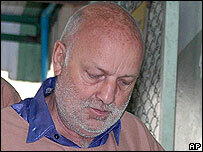 Jufer, who had faced a maximum sentence of 75 years, has lived in Thailand for more than 10 years. He was recorded on surveillance cameras defacing the portraits on the king's 79th birthday. Earlier he had tried to buy alcohol but been refused, since such sales are sometimes banned on important days. 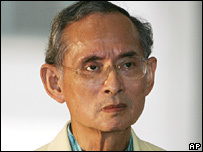 King Bhumibol, the world's longest-serving current head of state, is a very popular figure in Thailand. The case has highlighted strict laws in Thailand which forbid any criticism of the monarchy. Such is the sensitivity of the issue, says the BBC's Jonathan Head in Bangkok, that it is receiving little attention in the Thai media. Most Thais feel a deep reverence for their monarch. But they also fear discussing the institution because of the severe penalties for criticising members of the royal family. Jufer has a month to lodge an appeal against the sentence, our correspondent adds, but his best hope now is probably a royal pardon.